Side or print resulting from stamping. 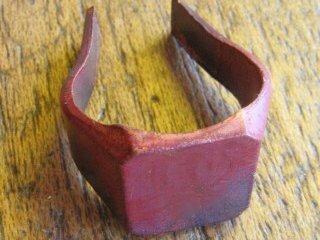 After heating with the blowtorch, formatted foot of ring, with the hammer and the pliers, (the jeweller must rather form a ring starting from a band of the metal). 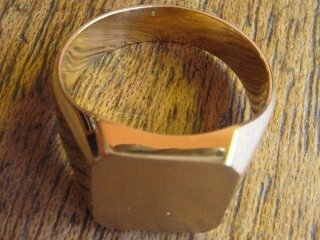 After welding in foot of ring for the size of the number of finger, the finish of the shape of the plate of signet ring must be carried out before carrying out polishing. From this moment, the stage engraving could start. 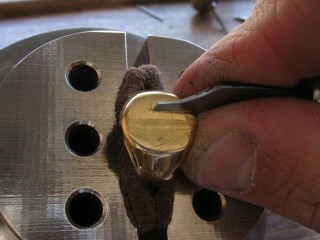 The positioning of the engraving figures takes account of dimensions of the plate of signet ring. The centring of work realizing and the tracing of the drawing for the future engraving are a very important stage! 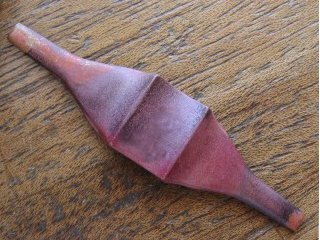 What is badly positioned at the beginning will not be retrievable at the end! The fifth stage, the carving in the onglette, raised by the first shavings. This work, what it is been realized, presented here, is an engraving to seal, this one must be in hollow and writing upside down. 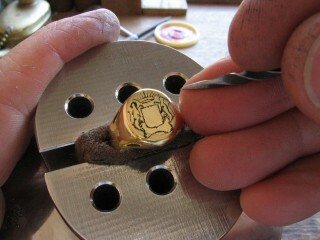 The engraver will use various tools to engrave the motifs or pattern, “onglettes, goujes, échoppes”. Engraving will be carried out stage by stage in order to always check the exactitude of the work completed before created to the motifs following. Last stage, control, to see resumed before finishes. Last fettlings before completions and take of seal for checking of work. 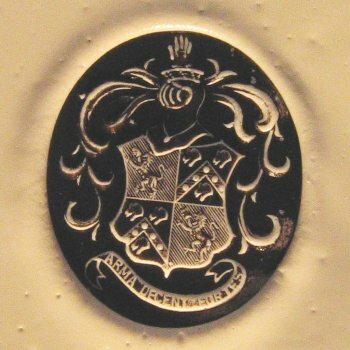 Taken of print on wax, a wax for the engraver (for files) and one for the customer, because it is on the seal that the customer will be able to read exactly coat of arms carried out. The work is completed! 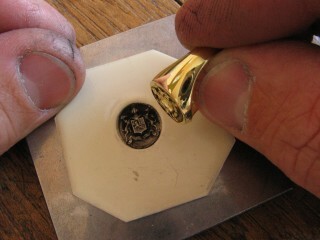 NB: It is to be specified that for a good reading, and because of the work of heraldic engraving on a plate of signet ring is meticulousness, the colour of the smallest figures, are not expressed by the engraver. If he wanted it, he could make but it is with the detriment of the legibility of the object.